When you’re a new parent, well-meaning friends and relatives may delight in sharing with you their own woeful tales of sleep deprivation, endless crying and frazzled nerves. What may not occur to you in the midst of all this unsolicited advice is that babyhood can be enjoyable and wonderful. Educating yourself with the right information from the start will help you build a confident foundation. Baby Care will dispel the myths and alleviate the confusion so you can get on with the awesome task of peaceful parenting. Nicole Pierotti – psychologist, parent, writer, columnist and sleep and behaviour expert – has lovingly distilled more than fifteen years of research and experience into this easy to read guide to caring for your baby. cries a lot and sleeps very little. Babies only cry if they are sick, hungry, uncomfortable or tired. Baby Care is the parenting companion that contains the answers you need to keep your baby healthy, well-fed and abundantly adored. 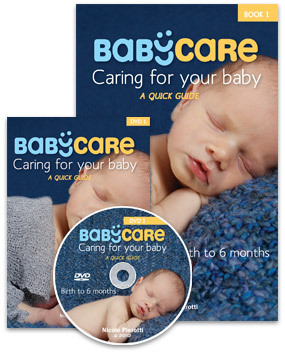 Nicole recommends that you use the book in conjunction with the Baby Care DVD. The Book is really the text in an easy to read format that accompanies the DVD. Nicole has spent 10 years putting together a one-on-one workshop for parents-to-be to learn how to care for their baby. Often parents leave hospital after focusing on pregnancy and birth to find themselves overwhelmed as they arrive home as to what their baby needs. Often finding that their baby cries and cries. Parenting doesn't have to be this way. This is very helpful for new moms like me.